The Khama Rhino Sanctuary is a 4 300 hectare Kalahari reserve that was created to conserve Botswana's diminishing Rhino population. 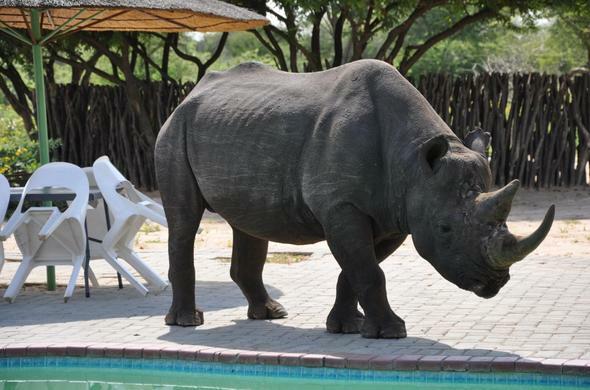 This is one of the best places in Botswana to see White Rhino. It is located about 25km outside of Serowe, one of the largest traditional villages in Africa. The reserve is a couple of hours outside Francistown and is a good stop over for tourists who are self-driving to Botswana's northern reserves. The Khama Rhino Sanctuary consists of Kalahari type habitats with sparse vegetation. In the middle of the reserve is the normally dry Serwe Pan, which has plenty of natural waterholes in the vicinity which provide life-giving water for many of the regions animals. The reserve is home to over 30 White Rhino and two Black Rhino. These are the result of an intensive reintroduction and breeding program over the last 20 years. Due to the threat of poachers, the sanctuary is well patrolled, helped by the Botswana Defence Force who are based just outside the reserve.Khama reserve has well maintained and signposted roads which make this reserve ideal for those doing a self drive. That said - you do need a 4 wheel drive vehicle to negotiate the roads within the reserve. The reserve gates open at 08:00 hours and close at 19:00 hour's every day. You can buy a very informative map of the reserve at the entrance that details the routes in the reserve. You can also join scheduled guided game drives which set out at 06:00 hours and 16:00 hours each day. You can also go on guided night game drives which are a great chance to see the nocturnally active animals such as Leopards and Aardvark. The night game drives depart at 19:00 hours. Burchell's Zebra, Eland, Springbok, Gemsbok and Giraffe as well as Blue Wildebeest are often seen in the reserve. Night game drives are allowed in the reserve and these are a great opportunity to see animals such as Leopard, Brown hyena, Caracal, Aardwolf and Aardvark. The reserve is unfenced and sometimes migrant species pass through such as the occasional pack of Wild Dog, a lone Elephant or Cheetah, so you never know what you might see. In the southern part of the reserve you can stay at Mokongwa Camp, a short drive from Serowe Pan. The camp has 5 chalets which have en-suite bathrooms with hot water. Bedding and towels are provided. They have braai (barbeque) facilities outside and basic cooking equipment. There is also a campsite which has taps for water and two ablution blocks. The campsites each have their own braai stands. This camp is situated overlooking Serowe Pan. It offers just 4 chalets. These have bush toilets, hot shower facilities and a braai place. Basic cooking equipment, crockery and bedding are provided. There is also a communal braai site and an ablution block. The Khama Rhino Sanctuary is situated 25km (15miles) outside of Serowe on the main tarred road between Serowe and Orapa. Turn off north to Orapa as you come into the village from Palapye opposite the Serowe main mall. The sanctuary is on the left hand side of the road approximately 5km (3miles) beyond the village of Paje. Take the road south for about 180km (112miles) and you will see the sanctuary entrance on your right.